New York Fashion Week is underway, and this means the hottest new trends for the fall/winter 2018/2019 season are being shown to us! Of course, my favorite trend to know about ahead of time are the trends in colors. 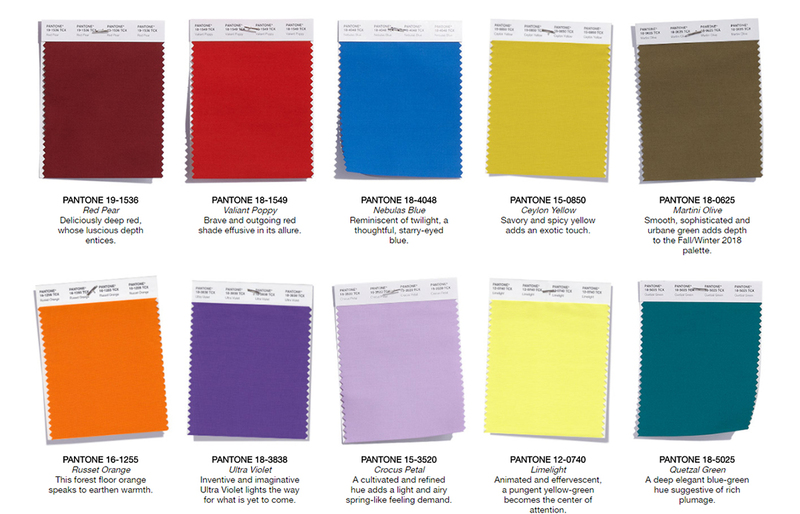 Pantone has released their seasonal color report today, showing us the top ten colors for the fall 2018 season, as well as the top five neutral or “classic” hues we need to be wearing in the fall 2018 season, and in winter 2019! Top Five Classic Colors for fall/winter 2018/2019 from the New York Fashion Week runways. Of course, we knew we would see the color of 2018 in the color palette for the next cold weather season; Ultra Violet. In addition to lavender, and ultra violet, designers are showing both a fall yellow hue, and a bright, cherry yellow shade. Yellow has been emerging over the past couple of seasons as an important color in fashion; this means it is time to start adding this happy hue to our wardrobes! If you don’t like to wear yellow, try a handbag or a pair of shoes! My favorite colors from the palette are Ultra Violet, Nebulas Blue, and Quetzal Green. Which colors are you drawn towards? Is anyone else glad to see that blush has finally dropped off the color palette? It’s a pretty color, but seemed to stick around too long; in my opinion. Stay tuned! I am in New York attending fashion week, and will bring you runway coverage as the week progresses.